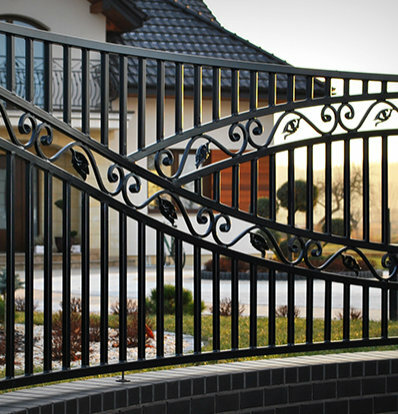 The company Pszczółka Ogrodzenia with headquarters in Brzeźnica near Bochnia since 1988. as a family company, I deal with the production of modern gates and fences. The initial product of our company was the fence mesh, after a short time, our offer was joined by entry gates, sliding gates and swing gates. From the very beginning of our company’s operation, we strive to ensure high quality of our services and products, meet the expectations of even the most demanding customers. Our fence gates are galvanized, and the additional anti-corrosion coating is a powder coating, this combination provides excellent protection for durability and a guarantee of the highest quality products for many years. Sliding gates and swing gates are made for every dimension for individual clients to private premises. Industrial gates constitute security for companies, warehouses, halls and sports facilities. These products can be additionally equipped with gate automation, which will improve the comfort of your life. Currently, we deal with the comprehensive construction and assembly of fencing systems, we are able to meet almost any order in this field. In our offer you will find solid and durable yet modern fences forged, panel, metal (profiled, palisade, blind), concrete (split, modular), mesh, wood (wood-metal) and solid enclosure fences. Many years of experience of our company can provide you with professional services in the field of comprehensive fencing construction, for which we give you a guarantee. We approach each client individually, we offer assistance in the field of professional consulting, considering unusual technical solutions related to the terrain. We make a free measurement and valuation of the fence. At the customer’s request, we design and visualize, which will greatly facilitate the selection of the gates and fences pattern. We provide our services mainly in the Lesser Poland voivodship. In the vicinity of the cities of Kraków, Bochnia, Brzesko, Tarnów, and Limanowa. We are open to cooperation and we invite you to familiarize yourself with our full offer and see photo gallery of our projects.